“I don’t want to hear the word ‘cruise’ ever again.” So said passenger Kendall Jenkins as she disembarked from the Carnival cruise ship Triumph on Feb. 14, after enduring five days adrift in the Gulf of Mexico with no electricity, no heat, no air conditioning … and raw sewage sloshing out of the toilets. The ocean liner had suffered a fire, which didn’t immediately threaten the wellbeing of the 4,200 passengers on board, but which knocked out all power and related systems. Coverage of the disaster was extensive, with CNN alone putting multiple reporters on the scene: one in a boat, one in a helicopter and two onshore. The stock price for Carnival’s parent company plunged after the incident and has yet to fully recover. And it’s almost certain the lawsuit machine is in high gear. “It’s like being locked in a Porta Potty for days,” another Triumph passenger commented, which was probably not the customer experience Carnival was shooting for. “#Badidea! Back to the drawing board!” So tweeted someone at JPMorgan Chase after the superbank’s attempt at a career-related Q&A session went terribly wrong. The bank had hoped to reach out to students considering someday working at the bank, and put one of its top executives in the Twitter hot seat to answer related questions. Twitter users bombarded the JPMorgan exec with questions like “what’s your favorite type of whale” and “what illegal deals did Jamie Dimon and the other big banks make with Obama at the closed-door meeting on Oct 2, 2013?” The most pointed question might have been: “Do you know what fiduciary duty is?” Needless to say, the bank quickly shut the Q&A down. CEO Jamie Dimon couldn’t have been happy. With record payouts and fines for mortgage related abuses already marking 2013 as an annus horribilis for the bank, an ill-conceived social media experiment was probably the last thing JPMorgan needed. A #Badidea, indeed. In 2006, when asked about the brazenly sexual nature of the company’s advertising, Abercrombie & Fitch CEO Mike Jeffries told Salon magazine: “Candidly, we go after the cool kids. A lot of people don’t belong [in our clothes], and they can’t belong. Are we exclusionary? Absolutely.” For whatever reason, the comments didn’t elicit much attention at the time, but turned up more recently in a book called The New Rules of Retail, at which point they decidedly did. For Jeffries, maybe the only thing worse than being talked about is not being talked about. But in an era where there’s greater awareness than ever of the dangers of youth obsessing over body image, he’s probably lost his status as one of retail’s cool kids. In March 2012, a former employee at Paula Deen’s “The Lady & Sons” restaurant filed a lawsuit against her, alleging, among other things, racial harassment at work. In comments from the deposition for that lawsuit that surfaced in June, Deen admitted to using racial slurs, setting off a media firestorm that brought down her media empire. In the space of weeks, Deen lost her Food Network show, multiple lucrative endorsement deals —including ones with Walmart, Target and pharmaceutical giant Novo Nordisk — as well as a five-book publishing deal with Random House. She posted several apologies to YouTube, and made another on NBC’s The Today Show, but Deen was done. In May, the Internal Revenue Service admitted it had targeted conservative organizations seeking tax-exempt status for audits, watching for groups that used words and phrases such as “Tea Party” and “patriot” in their applications. On the conference call apologizing for the agency’s actions, senior IRS official Lois Lerner said that between 2010 and 2012 there was a “surge in applications for tax-exempt status” and that agency employees used these search terms as shortcuts. A shakeup at the top of the IRS ensued, along with much political and media handwringing. When it was later revealed that the IRS had also targeted liberal groups using the terms “progress” or “progressive” and seeking the same kind of tax-exempt status, it didn’t make much of a dent in the revenue department’s battered reputation. On that same conference call with reporters Lerner responded to a journalist’s question about a statistic with: “I’m not good at math.” A senior revenue collection official stating she wasn’t good at math didn’t help the agency’s reputation very much either. On the same day HealthCare.gov was set to launch, parts of the federal government were forced to shut down for the first time in almost 20 years because of a congressional budget impasse and Republican opposition to Obamacare. The Republican-controlled House of Representatives wanted to strip funding for the health care law. The Democratically controlled Senate wouldn’t hear of it. Neither side blinked, and on Oct. 1 an unfunded federal government closed shop for all but the most essential functions. Adding to the drama, the U.S. government was poised to default on its debt if Congress didn’t raise the limit on federal borrowing. The government remained closed until Oct. 17, long after many Republicans realized they were losing the public relations battle. To all but the most strident conservatives, the GOP came out of the whole affair as extreme, unreasonable and dangerously unbending, and its poll numbers plummeted – all at a time when the media would have otherwise been focused on the Obamacare rollout. We all know the way things were supposed to go … and the way they actually went. On Oct. 1, Americans nationwide were supposed to be able to quickly and easily shop for health care coverage at HealthCare.gov, the federal government’s official insurance marketplace. But from the start, the site’s plan selection and sign-up process were plagued by glitches and malfunctions of nightmarish proportions, bringing a storm of criticism down on the Obama administration from both the left and the right. To make matters worse, President Obama’s repeated promise that everyone who liked their health care coverage would be able to keep it turned out to be untrue, with many receiving notices from their insurance companies that their existing policies would be cancelled. The Patient Protection and Affordable Care Act will most likely be President Obama’s signature legislative achievement. It’s difficult to imagine how the rollout of one of its key components could have gone any worse. At the beginning of the year, BPRSDC took a break to realign the organization. Throughout 2012, you have shared feedback, suggestions and requests for stronger programming, enhanced networking opportunities and additional member benefits. During this three month break, the BPRSDC leadership team took your suggestions and realigned BPRSDC goals and objectives to better serve your needs. In doing so, we redeveloped our programming calendar to offer you key workshops and events to support your career journey, we developed key partnerships to strengthen the organization’s networking arm, and we’ve welcomed new leadership to help drive continued growth for the organization. Now…………… we would like to welcome you back. Our new 2013 Calendar of events offers you key workshops and events geared towards your interests in social media, career opportunities, entrepreneurship, entertainment PR, and even APR accreditation. We are also introducing June as Member Appreciation Month. During the month of June, we will share weekly career tips and job opportunities (every Friday) to all members. After June, we will transition these weekly alerts into monthly membership alerts. We will also offer free admissions to all members to the June 2012 Social Networking Happy Hour, which will feature local media representatives and bloggers. This is our way of saying thank you. If you are interested in joining BPRSDC, please click here to join and also register for the May event. Read my annual message here. PRSA-NCC offers a half-day course to introduce potential candidates to the Accreditation (APR and APR+M) process and provide professional instruction in the two KSAs that are most heavily weighted on the exam and Readiness Review. Instruction is led by seasoned APRs and college-level instructors. Register here. 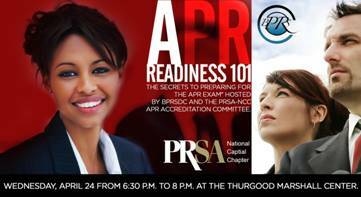 Take a moment to get to know our speakers for “APR Readiness 101″ April 24, hosted by BPRSDC in partnership with the PRSA-NCC APR Accreditation Committee. This workshop is free of charge; however, registration is required. Barbara Burfeind, APR+M, Fellow PRSA chief, Visual Information (VI) Plans & Integration, Defense Visual Information Directorate, handles policy and management of all Department of Defense imagery assets. She has coordinated proponency visits with more than six Combatant Commands, gathering feedback used to shape VI policy and operations for the future. She has drafted a Joint VI Concept of Operations (CONOPS), providing an overview of the Joint VI Enterprise, which includes VI planning and case studies. With more than 25 years’ experience as a public affairs and communications professional, she previously was a senior adviser for the deputy assistant secretary of defense for joint communication, working on strategic communication education initiatives, information sharing and collaborating with the interagency and combatant commands on public affairs and strategic issues, and providing input and feedback on strategic communication policy and doctrine. Burfeind earned her APR certification in 2000, and the +M certification in August 2010 as a member of the APR+M Advisory Council, overseeing the Accreditation process for U.S. military communicators. She was the 2011 APR+M Council chair, and was previously the 2009 Chapter president and Accreditation committee chair for the PRSA National Capital Chapter. Jack Holt is the Sr. Strategist for Emerging Media for the Department of Defense (DoD), Defense Media Activity. For the past two years, Mr. Holt has developed communication strategies and tactics to maximize the effect of DoD communication efforts by incorporating New Media tools with traditional Public Affairs channels. Holt has briefed dozens of SES and flag officer senior leader forums on New and Social Media, and conducted strategy sessions to address corporate level strategic objectives. Mr. Holt is a member of the Social Media for Government Transparency and Openness Program Advisory Board, the DoD Techipedia Governance Board, the University of Oklahoma Risk and Crisis Management Community Advisory Board, and 2009 Chair for the PRSA National Capital Region Public Affairs and Government Committee. He has taught sessions on New Media strategies and tactics at the Defense Information School, the Naval Postgraduate School Strategic Communication Workshop and the NATO School Strategic Communication Workshop. Register for today’s event here. Which women social media experts have the strongest, most active followings? In that sense which are the real power influencers? Last year I researched that question and, with the help of Peek Analytics, produced a top 50 and a top 20 list. This year we’ve done the same. So here are the Top 20 women social media power influencers as assessed and analyzed by Peek Analytics’ software and by me. I will be following up with a Top 50 (male and female) Monday or Wednesday of next week. To create the list we took nominations here on ReThinking Innovation and did our own research to be sure we did our best to identify potential candidates. In total we assessed over 850 social media influencers. There were a few criteria for inclusion. The experts had to be writing about social media and not just marketing, though that criterion was loosely applied – writing about social media and content marketing for example qualified people. We were also looking for people who create content on a regular basis – not just people who are distributing other people’s content via Twitter. But the big deciding factor is how active a candidate’s networks are – Peek Analytics’ algorithm goes in search of those people who are in your network and your network’s network, and it assesses if those are real people or bots, and, if real people, how actively they participate in social media. By and large, that makes this a list of people with quality followings. Here is the list of top 20 women. We’ll follow up with further analysis of geographical distribution and the most active verticals. If you want to measure your own influence, you can do that by following this link. #2. Jessica Northey. It’s a trend this year, leading influences whose base is in a specific vertical For Jessica it is music. She also says she’s moving away from blogging towards Google +. @jessicanorthey. #3. Mari Smith. 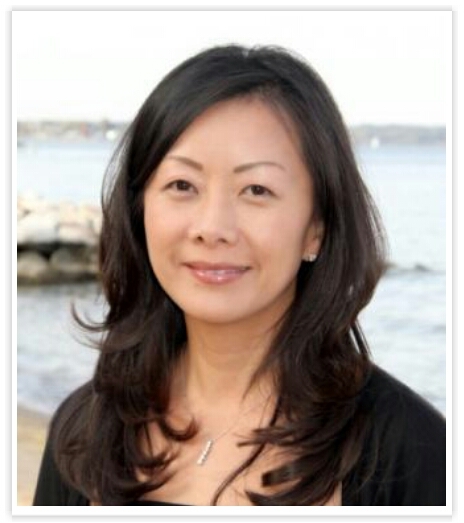 Mari is a leading Facebook marketing expert and one of the top 10, overall from last year. She’s also the author of The New Relationship Marketing. @marismith. #4. Liz Strauss. Liz runs successful-blog.com. She’s currently taking on the challenge of cancer. Best wishes. @lizstrauss. #7. Eve Mayer. Officially a LinkedIn expert writes about a diverse range of social media issues and tools – Pinterest, Instagram, Google +. @linkedinqueen. Republicans have been wringing their hands over how to catch up with Democrats on the technological front. But at least on the Hill, Republicans appear to be more readily adopting to the new modes of communication. While congressional Democrats have greatly upped their usage of social media to communicate with constituents in the past few years, Republicans continue to enjoy a formidable lead, according to a recent study by the Congressional Research Service, as highlighted the Federation of American Scientists Secrecy News. For example, in September 2009, only 38 percent of senators and House members had Twitter accounts. By January 2012, that percentage more than doubled, to 78.7 percent. Slightly more than 87.2 percent were on Facebook. Americans once watched admiringly as celebrities like Bob Geldof and U2′s Bono took the stage to alleviate hunger among the world’s poor. But today the game has changed: the world’s impoverished economies have become the world’s emerging economies, with growth rates already outpacing the U.S.—and a slew of lingering socioeconomic problems. Read more here via Forbes. While my firm is incredibly fortunate to employ some of the very best PR and social media practitioners, we’ve also had a number of staff members who simply weren’t cut out for our business. Sure, they were good, hard-working people, but the writing was on the wall early on that they weren’t cut out for public relations. 1. You receive critical feedback, well, critically. Critical feedback is a way of PR life and professionals in this business are required to have thick skin. Even the very best piece of secured coverage can generate commentary from a colleague or client about a key message that was missed; the most successful social media campaign may result in a request for more “likes” or a greater number of followers. And that’s the results end of the campaign. The feedback during materials development and/or project management is typically without a filter and often comes from a number of sources including colleagues, managers, and clients. Critical feedback is part of the gig, and the best you can do is embrace it, learn from mistakes, and improve moving forward. Can’t handle it? Consider another career. 2. You think the PR job (or project) is finished. An old and great client of mine, Jim Gustke, now the vice president of marketing at Internet phone company Ooma, once told me (wisely) that the problem with PR (and social media, marketing, etc. ), is it’s never finished. PR people can always do more. And these were the words of a satisfied client—one who understood that the agency support I was providing his organization was the very best I could do under the budget, program, and business circumstances. It’s hard to forget the famously incorrect “Dewey Defeats Truman” headline from the 1948 presidential election. Heading into the 2012 election, the potential for errors to spread is greater than ever before— largely because of social media. While social media enhances our reporting, it also forces us to think more carefully about where we get our information, how to verify it and how to balance accuracy with speed in a 24/7 news cycle. Here are six new social media errors journalists could make on Election Day, and tips for avoiding them. How can staffers use social media to their advantage when covering the election? Should staffers avoid making predictions on social networks? Can staffers say who they voted for, or share their opinion about the winning candidate? Are staffers expected to verify information before they post it on social networks? What system, if any, does your newsroom have for verifying information on social networks? What about retweets? Are staffers expected to verify voting-related information before retweeting it? The Associated Press has told staffers “not to blindly retweet what others may be saying” about election results on Tuesday night. Here’s a helpful Atlantic piece on how to tweet responsibly during a breaking news event. Be wary of retweeting information from fake or anonymous accounts. During Hurricane Sandy, journalists were fooled by an anonymous account, @ComfortablySmug, which was tweeting incorrect information about the storm. One of the incorrect tweets — about the New York Stock Exchange being flooded — was retweeted 650 times. Earlier this year, journalists fell for fake accounts for political news analyst Cokie Roberts, North Carolina Governor Bev Perdue, former New York Times Public Editor Arthur Brisbane, and Wendi Deng, wife of Rupert Murdoch. Look at the Twitter bio. If there’s not a name associated with it, be cautious. If a location is indicated in the bio, consider whether the information lines up. If the bio says the person behind the account is located in Colorado, and they’re tweeting photos of breaking news on the East Coast, that should raise a red flag. If you’re curious about an account’s tweets, try DM’ing or @’ing the person behind it to find out more. Be especially skeptical of tweets that say “BREAKING NEWS” or use journalistic language if they’re not from a journalist or a news organization. Bottom line: Do some quick research before spreading information from an account you’re not familiar with. If you’re asking voters to send you photos or updates from their polling places, don’t assume all the photos you get are real; if they seem too good to be true, they probably are. When tracking political events on social networks, it’s easy to draw conclusions about what the posts mean. 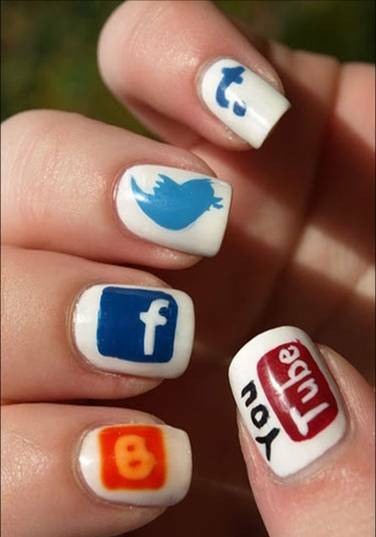 Avoid doing this when covering the election, and remember that not everyone uses social networking sites. Only 16 percent of U.S. adults who use the Internet are on Twitter, and their views aren’t representative of the whole. A recent Pew study pointed out that the people most likely to use social networks to post information about politics tend to be further from the center — liberal Democrats and conservative Republicans. For more information about how to add context to — and understand — social media sentiment, read this piece by my colleague Regina McCombs. The news cycle is more accelerated than ever, largely because of social media. Some news organizations that have moved too quickly in the past have spread misinformation during major news stories. When you start to hear news about winning candidates, ask yourself: Where is this information coming from, and how do I know it’s true? You can let your audience know you’re in the loop by tweeting/posting something along these lines: “X is reporting Y, but we haven’t yet confirmed the reports.” Or, “We are working on this story and will tweet updates as soon as we have them.” or “Here’s what we do know…” This will send a message to your audience that you are committed to accuracy. If you do spread misinformation online, take steps to correct it. Data has shown that incorrect information travels faster on Twitter than corrections. Because Twitter doesn’t have a correction tool, it’s up to journalists and news organizations to correct the information — and make sure as many people see it as possible. Tweet the corrected information more than once, and use Topsy or WhoTweetedMe.com to identify the most influential people who tweeted the incorrect information. Reach out to them on Twitter and let them know about the correction so they can help spread the word about it. Also, make sure to correct errors not just on social media, but on all platforms where the news circulated. Here are some additional thoughts on how journalists can do a better job correcting errors on social media. Mistakes happen, but if your news organization has a social media plan in place, you’ll be much less likely to make them. Who knew Sesame Street’s Big Bird would play a role in tonight’s presidential debate in Denver? About 30 minutes into the verbal contest between President Obama and Republican challenger Mitt Romney, the former governor explained that he would cut what he considers non-essential items in the budget, including cuts to PBS, which employs debate moderator Jim Lehrer. At that point, someone in the Twitterverse responded by creating a @FiredBigBird account, which, as of this writing shortly after 10 p.m. ET, had almost 9,900 followers.